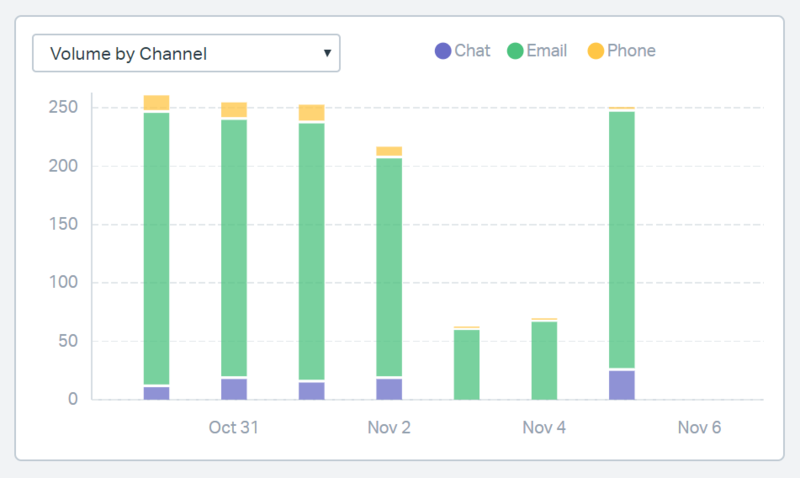 The All Channels report is all about volume, but it also helps you get a handle on just how busy the help desk is. More importantly, you're able to really dive in to see what type of issues keep popping up. Note: If your reports don't look quite like what you see in the article below, these changes are coming soon! 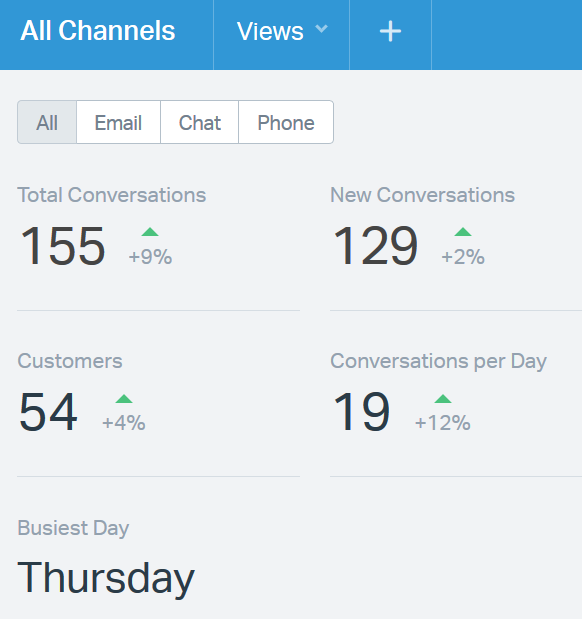 Take a peek at What’s New with Channel-based Reports for more info on the changes you'll be seeing. If you have any questions, just let us know! Just how much work are we really doing these days? From total conversations to your busiest day, each metric provides different insights. Why was Monday so busy? Was there an outage or an issue with our product? It looks like we helped more customers this month than last, why was that? Do we need to shuffle support schedules a bit? 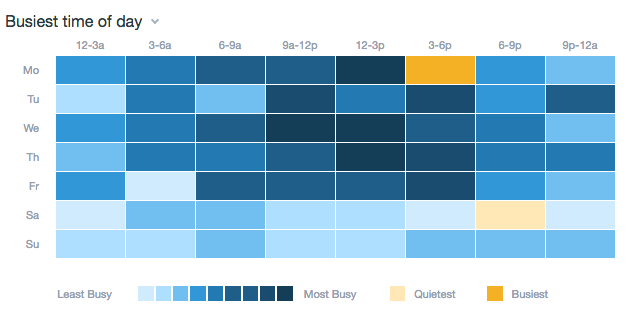 Take a look at the at the Busiest time of day heat map. Hover over a block to see how many conversations were created during that time period. You might find this helpful for hiring, or making sure that you've got extra hands on deck during peak hours of the day. How do our customers reach us? Should more of the team be available for chat or phone calls? We see a small surge of chat on Friday, why was chat more popular that day? Hover over the bars to see a breakdown of your support volume by channel type. What do our customers write in about? If you've been using tags to categorize and sort conversations, you're going to love this little table. We show you the top tags for the given time period, as well as how they're trending based on the comparison period. You can click on each tag to pull up those specific conversations. Are we seeing a change in the type of requests we're receiving? If your team has been using Saved Replies to answer conversations, this table will show you just how many times they've inserted a particular reply. In our example below, we can see that the team used the Shipping Timeframes reply quite a few times. Maybe we need to make shipping timeframes more clear on the website? You can easily click on a saved reply to see a list of conversations where the reply was used. Is there anything we could automate or route differently? 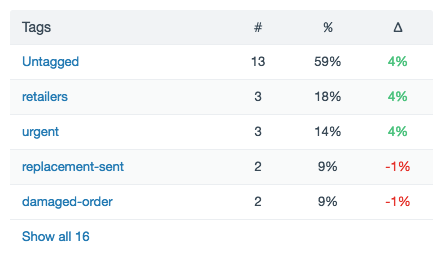 In our example below, the Order Questions workflow fired 33 times. That might mean that we need to be a bit more clear with our customer communications, or that the workflow is doing its job by sending a bunch of order questions to a specific team member.